Any mamas out there in need of some soul refreshment? Then stay tuned, we have a brand new series just for you! 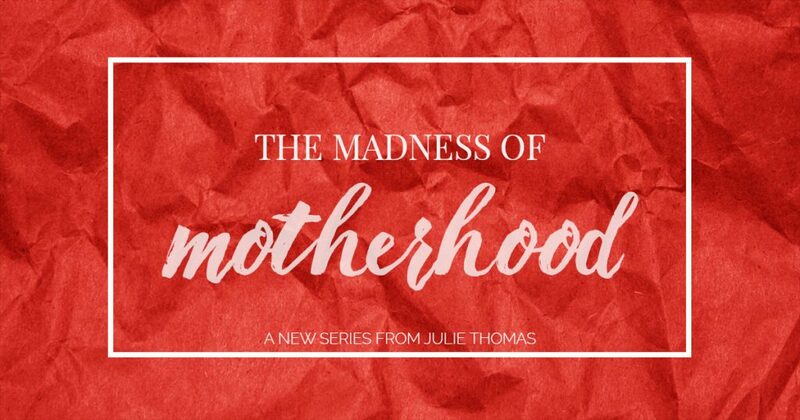 Starting Monday, we will launch The Madness of Motherhood, a 4-week online series that will breathe fresh life into your heart, no matter what age or stage of parenting you are in. Because, truth be told, we are all mamas who love our babies, no matter how old our babies are. We have seen their sweet faces from their early moments of life, wiped their messy hands and bandaged their scraped knees. We are mama bears who will go from zero to 100 if someone dares to mess with or hurt our child. We are warriors who stand on behalf of our child in doctor’s offices, IEP meetings, and college entrance offices. We are givers of life, whether we labored our babies home through the pains and pushes of childbirth, or the pains and pushes of laboring our children home through the foster care system, domestic adoption courts and foreign governments. We stay awake with them when they are sick or hurting or need something to eat, whether that meal is from us directly, or from our refrigerator as they stare into it, endlessly, with the door wide open. We are all mamas, wondering if we’re doing this whole parenting thing right. Pretty sure we’re actually not. We need more friends, good food and good coffee. We need more kindness in our lives, to be seen and understood. We need space to breath and space to dream. and all of it made right in the end. where our past makes sense and our scars are soaked in redemption. Because in the end, we all just want to write a great and beautiful story. If we were sitting at a coffee shop, and I asked you to show me pictures of your babies… you feel it, don’t you? As you pull up those pictures…you feel that love, that enormous tug at your heart towards these ones you call your own. You love them with every fiber of your being and hold so tightly to the story of how they became yours. We all have our unique stories of how our babies became ours, and we can tell it like it was yesterday. We know every single person who was there and how it all went down. We can hear the sounds of that day, feel the warmth of their skin against us, smell the tops of their heads, see the life in their eyes. On that day, it began, this journey called motherhood. What a miraculous, amazing and incredible moment…the moment you became a mom. It is an interesting thing to become a mother, isn’t it? You’ve prayed and prayed (and prayed) to be a mama, planned and prepped, did as much as you knew how. You know what I mean, right? What in the world had happened? No idea I could be so tired. So emotional. So overwhelmed. I didn’t know that from day one I would battle this constant message telling me I’m not enough. I had no idea I could be laughing with my children in one moment, and consumed with frustration and anger in the next. I had no idea that even though I was surrounded by people all day, I could feel so isolated and alone. I didn’t know that as my children grew up, I would worry more than I ever imagined, and that fear would masquerade itself as control, anger and busyness. I also didn’t realize that I could so fiercely love another human being with every ounce of my soul. Whether I cradled my little ones in my arms or they stood taller than me, they could look at me with those sweet eyes and cause my heart to fall apart into a million pieces. It’s the hardest best thing you will ever do. That’s exactly why we created The Madness of Motherhood. What will the series hold? We will look at the importance of our story and the incredible calling of motherhood. We will take some time to breathe and remember our incredible value, to ourselves, our families, and our God. We will seek to discern how best to navigate life’s transitions and hurts. We will dream about our future and the legacy we want to create for our family. Holding it all up with scripture, verses from God’s Word written specifically to be our very lifeline and hope. Sign-up here, then over the next four weeks, you’ll have the series sent directly to you. Encouragement dropped into your life to hopefully break through the crazy, and remind you once again that you matter. Need a dose of encouragement between now and Mother’s Day? The Madness of Motherhood – REGISTER TODAY!